I’ve been spinning by head around to understand how to use this Azure Storage concept for quite a while, so I’ve decided to share my findings. The most useful web resource I found was this blog entry. Here I’m gona give a less API-driven approach, which is faster as long as you know which containers / blobs you want to share in advance. What is shared access signature good for? It gives access to the entire storage account (table, queue & blobs). The only way to revoke access is to regenerate the key, in which case, everybody using it will be denied access. Basically, it’s not very granular. On top of that, the key must be passed in an HTTP header, which isn’t browser friendly. Shared Access Signature is an alternative way to authenticate against Azure Storage. As far as I know, it’s only useful for blobs. 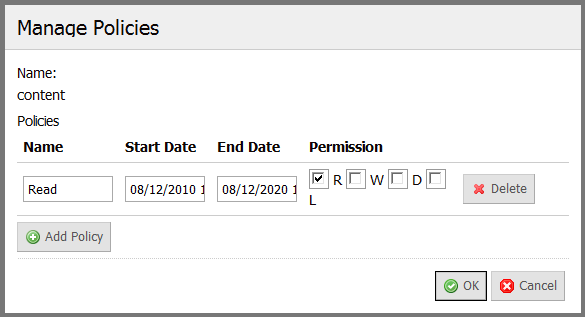 It’s granular, since it can go to the blob level to grant permissions, permissions are also more granular (read, write, list, delete) and the revocation can be automatic (duration) or done on each share access. The easiest way to quickly can a hang of it is to go to https://myazurestorage.com/. Now this site looks pretty dodgy but it actually belongs to the Windows Azure team, so you can feel free to enter your credentials in. First thing, you enter the storage account name and the primary key (actually, the secondary works as well). You can then go to the blobs tab. If you don’t already have a container, you can create one there. 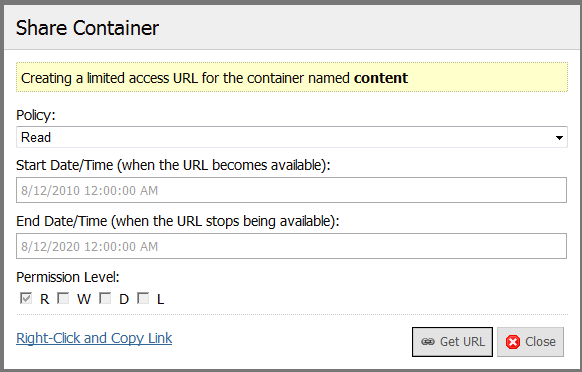 What I’m going to do here is to give read access to the entire container named content. I select the Manage Policies menu option on the container menu. Basically, I’m creating a policy named “Read”, starting today, ending in 2020 giving read permission. I click OK. I then select the Share menu option on the container menu. sr, the resource, here c which stands for container. If we shared a blob, it would have been b.
I can revoke access to the container by changing the policy. Basically when you click the Get URL button, Azure does spit out a signature and remembers it. So this URL is good forever, although the policy underneath can change. We can also share the container directly, without using a policy, but the URL generated would contain the policy itself, ie the start time, end time, etc. . It is therefore less secure since if this URL becomes compromise, there is no way to revoke access. For this reason, the API limits the exposure time to an hour: we can’t give access for more than an hour this way. Hope that gave shade some lights on the issue of shared access signature, have fun! Very useful article. Thanks .